Whether your goal is to reduce your smoking habits or quit smoking altogether, Slighter can help. Powered by Artificial Intelligence software, Slighter learns when you smoke and creates a personalized plan to help you reduce smoking gradually. With a sleek design, a full color touch screen, and seamless connectivity with our app, Slighter is the innovative smoking cessation tool you’ve always wanted. 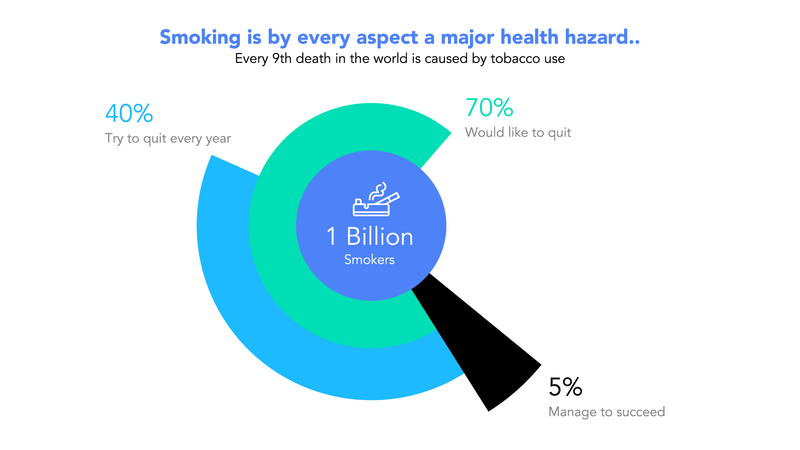 With roughly 1 billion smokers worldwide, studies show that 70% of these smokers have a desire to quit with 40% actually attempting to do so, and yet, only 5% achieve that goal. Why is the success rate so low and what keeps the majority of smokers from trying? The answer is simple: the existing cessation methods are ineffective. While smoking cessation programs can vary, most of them rely on chemical-based substitutions, therapy, or a strong sense of will power. These methods rarely treat the habit of smoking and the relapse rate is shockingly high, especially as withdrawal symptoms increase. For example, the majority of quitting solutions (nicotine patches, nicotine gums, the drug “Champix,” E-cigarettes, and IQOS to name a few) serve merely as a substitute, often providing the nicotine without including the other harmful chemicals found in cigarettes. These various solutions only focus on the physiological aspect of smoking while ignoring the psychological and social implications associated with smoking cessation. In the case of nicotine substitutions, you may remove yourself from the physical act of smoking, but you are still completely reliant on feeding your nicotine addiction. Only about one in five smokers succeed in quitting for six months or more. Only a very small minority of smokers continue to use medicinal nicotine products long term, which causes the risk of relapse to increase substantially when medicinal nicotine is no longer used. With relapse so common among smokers attempting to quit using nicotine substitution products, it’s clear that the vast majority of these quitting methods are not strong substitutes for smoking. Additionally, psychotherapy and hypnosis have yielded mixed and inconclusive results, and are typically only recommended when used to supplement other quitting methods. Unlike other quitting solutions, Slighter was created to treat both a smoker’s habit and nicotine addiction, using a method known as Nicotine Fading. By effectively reducing your number of daily cigarettes, you condition your body to become less and less reliant on nicotine. This gradual process of reduction minimizes withdrawal symptoms, which often are too great to overcome using other cessation methods. By successfully reducing your daily intake of cigarettes, you can reach an unprecedented level of confidence that will enable you to quit the habit altogether. Compared to other cessation methods, Slighter is a non-invasive, well-rounded solution that relies on analyzing the smoker’s habit to assist him or her in quitting smoking while taking into account his or her physiological, psychological, and social needs. Slighter allows the smoker to continue smoking cigarettes while deciding to either reduce or fully quit smoking. 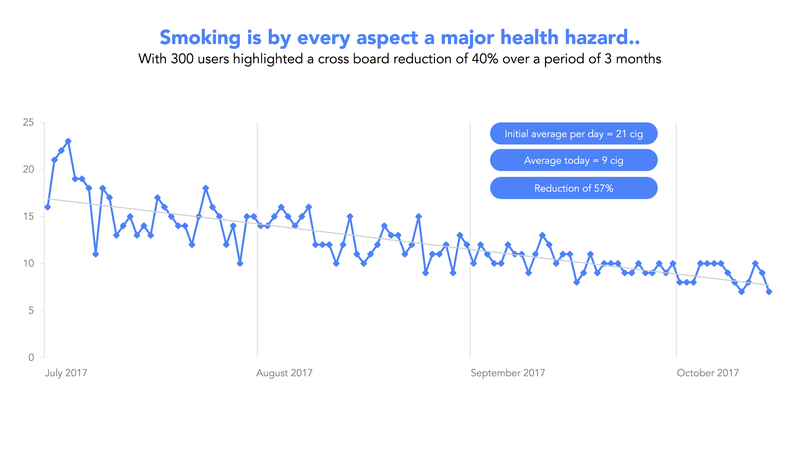 With its innovative artificial intelligence-based algorithm, Slighter continuously learns and analyzes the smoker’s behavior in order to develop a personalized reduction program that automatically adjusts to any changes (good or bad) in the smoker’s behavior. The key to success in Slighter’s reduction program relies on time, flexibility, personalization, and community involvement. The AI algorithm gradually removes cigarettes from the smoker’s plan, while Slighter grants the smoker greater flexibility in controlling their own reduction plan with the “Skip,” “Friend,” “Snooze,” and “Cheat” features. With the Slighter mobile app, the smoker can visually see their plan along with the progress already made, stay motivated with challenges and notifications, as well as a compete with friends using our online community feature. Lastly, Slighter is a simple one-time purchase unlike other methods requiring the user to buy additional medications or refills. Slighter is competitively priced, costing roughly the equivalent of 2 weeks’ worth of smoking for an average smoker of one pack per day. Not only is Slighter very affordable, but it also saves you money by helping you reduce your cigarette consumption. Once you start your own reduction plan with Slighter, you’ll be able to see how much money you saved by buying less and less cigarettes. Should you need additional incentive to buy Slighter today, you can use our own calculator to see how long it would take you to recoup the price paid for Slighter. 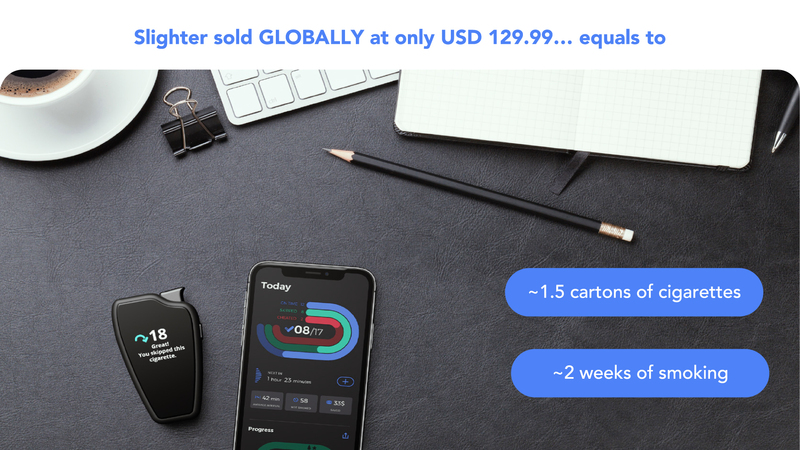 Slighter is also a sustainable solution: instead of buying numerous disposable lighters, you only need to invest in one device, which you can later resell or gift to another once you’ve reached your quitting goals. So, Does Slighter Really Work? Our testing success speaks for itself; in fact, our Beta testing results proved a 40% cross-board reduction over the period of only three months, with users reporting fewer or no side effects compared to other methods they tried before. Slighter stemmed from a man’s desire to successfully reduce, and ultimately quit, smoking. We’ve put in a lot of care, scientific research, and technological advances to ensure that Slighter is the leading quitting and reducing solution available to all smokers. Slighter is the ultimate smoking reduction tool and the latest in new IT technologies, thanks to its innovative software that supports you and adapts to your habits. With Slighter, your reduction goals are attainable and quitting becomes much more feasible.